Vacherin & Constantin. Bonhams watch auction 16th September 2014. 47mm. 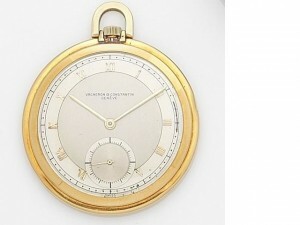 BOHAMS WATCH AUCTION 16TH September 2014. Info & photo courtesy Bonhams Auctions. 18-carat red gold case. Individual limited serial number engraved on the case-back. Water resistance: 3 bar (30 meters). Height 11.48 mm. Diameter: 43 mm. 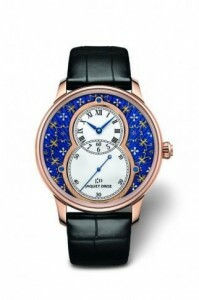 Blue Grand Feu paillonné-enameled dial. 18-carat red gold ring. Blued steel hands. Indications: Off-centered hours and minutes, large seconds subdial. Jaquet Droz 2663, self-winding mechanical movement, double barrel, 22-carat white gold oscillating weight. Jewelling: 30 jewels. 68 hours power reserve. Frequency: 28,800 v.p.h. Rolled-edge hand-made black alligator leather strap. 18-carat red gold ardillon. 18-carat red gold case. Individual limited serial number engraved on the case-back. Water resistance: 3 bar (30 meters). Height 11.48 mm. Diameter: 43 mm. Blue Grand Feu paillonné-enameled dial. 18-carat red gold ring. Blued steel hands. Indications: Off-centered hours and minutes, large seconds subdial. Rolled-edge hand-made black alligator leather strap. 18-carat red gold ardillon. Jaquet Droz 2663, self-winding mechanical movement, double barrel, 22-carat white gold oscillating weight. Jewelling: 30 jewels. 68 hours power reserve. Frequency: 28,800 v.p.h. 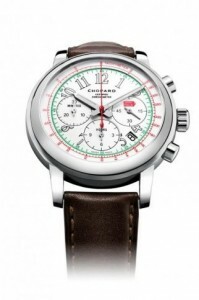 Chopard Mille Miglia Man’s wristwatch. 2014. Steel case. Glareproofed sapphire crystal. Crown and pushers in steel. Open back with special Mille Miglia logo around the rim. Total diameter 42.00 mm. Thickness 12.31 mm. Water-resistant to 50 metres. Matt beige dial with red, green and black transfers. Metallised black baton-type hour and minute hands. Red central sweep-seconds hand. Hour, minute and seconds counters at 6, 9 and 3 o’clock. Date window between 4 and 5 o’clock. Self-winding chronograph movement. 37 jewels. Approx. 42 hours power reserve. Frequency: 28,800 vph. Total diameter: 28.60 mm. Chronometer-certified (COSC). Brown Barenia calfskin strap. Pin buckle in steel. Monte Carlo.Hotel de Paris. Christies, in association with the Russian Bank Zenit, host a Private Selling Exhibition 17th-24th August 2014. This year, Christie’s Jewellery Private Sales and ZENIT Banking Group are pleased to announce their collaboration in providing our Russian clients a truly unique experience in exclusive locations worldwide. 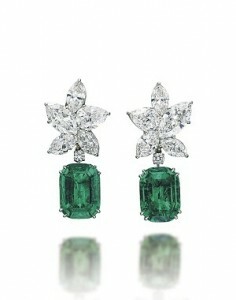 From 17 – 24 August, Christie’s will hold a private selling event at the exquisite Hotel de Paris Monte-Carlo, offering a stunning selection of jewels, watches and works of art to our dedicated clients, while hosting exclusive cocktail parties in Courchevel and Monaco in the summer, followed by Moscow London and Dubai in the fall. LARC. Latin American Racing Channel. Offers horse racing betting in Latin America & USA. LARC. Latin American Racing Channel sponsored races at Deauville La Touques race course August 10th 2014. LARC follows horse racing in certain selected countries and streams them live. LARC has direct links to racing websites in Argentina,Brazil,Chile,France (via the PMU betting org), Peru, UK, USA,Uruguay. In USA there is live transmission in the USA of the races at the Laurel Park, Pimlico, Calder, & Gulfstream Park race courses. Jerome Lenfant, News Director of Equidia, an organisation that promotes the P[MU & betting in France, is reported as mentioning that this link with LARC should increase the following of horse racing & betting as the traditional generation falls away. The PMU, the French betting organisation would dearly like to see turn over increase. LARC offers a membership service for interested followers of intl horse racing.Image courtesy LARC. TATTERSALL FAIRY TALE. BOUGHT FOR 800 GUINEAS AT TATTERSALLS BECOMES STAR RACE HORSE WINNING A GROUP 1 RACE AT ARLINGTON. The extraordinary rags to riches tale began when the filly by MYBOYCHARLIE out of the COMMON GROUNDS mare EUROLINK ARTEMIS was knocked down to Old Buckenham Stud for 800 guineas at the 2012 Tattersalls February Sale where she was consigned by Brookside Stud. She was subsequently resubmitted at Book 3 of the Tattersalls October Yearling Sale where she was knocked down to Scuderia Blueberry for 13,000 guineas. A wide margin winner of her first two starts for trainer Marco Botti and owners Scuderia Blueberry, EURO CHARLINE was then sold to Barry Irwin’s Team Valor for whom she finished fifth in the 1000 Guineas, third in the Group 1 Coronation Stakes and won the Listed Valiant Stakes, before landing her first win at the highest level at Arlington. Courtesy Tattersalls Press Release. Deauville Arqana Yearling Auctions 2014. No.11 sells for 1.200.000. Presented by Ecuries Monceaux. Deauville Arqana Yearling auctions 2014. Last night no 11 sold for 1.200.000. euros, sold by Monceaux Ecuries. Bought by Tony Nerses for Saleh al Hamazai & Imad al Sagar.The yearling comes from top German horse breeding stock..Image courtesy APRH. Last nite 65 Yearlings sold, 82% of those presented, up % on the same nite last yr.AVERAGE PRICE 249.800.Euros. 8 lots went for 500.000. euros or more. 29 at 200.000 or more.Demonstrating a strong buyers market. Anne & Etienne Drion, Coulances Consignment presented a strong card of Yearlings. 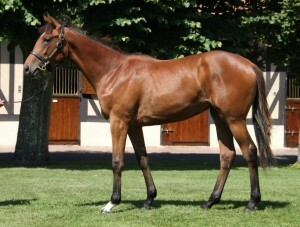 Lot 39 sold by La Reboursiere for 850.000 euro, issue of “Sea the Stars”. 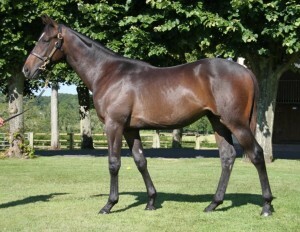 Lot 81 was bought by Anthony Stroud for 1.000.000 euro, sold by Haras La Reboursiere et de Montaigu. Lot 81 now belongs to Mayfair Speculators, South African investors with Marcus Jooste. Thru Peter Doyle Marcus Jooste also bought Lot 36 for 700.000.euro.Belonging to the Lagardere/Aga Khan team presented by Ecuries Monceaux. Ecuries Monceaux sold 9 Yearlings for 4.520.000 euro,with Lot 30,out of Invincible Spirit & Tonnara, sold for 850.000 euro, to Coolmore. Coolmore team were the top buyers last nite, investing in 4 Yearlings for 1.755.000 euro. 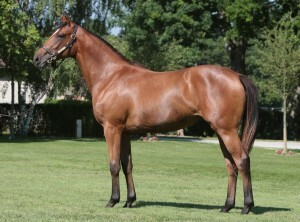 Mandore Intl.Agency bought 8 Yearlings for 1.715.000. euros. No.11 Image courtesy APRH. & Image from the Yearling sales room courtesy Maybelline Tilkens. 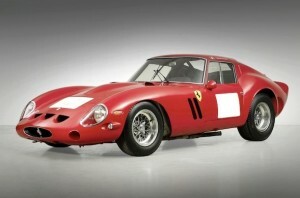 Ferrari 250 GTO smashes its way into the records, sold at auction for US$38.1 million. Bonhams Quail Lodge Auction. 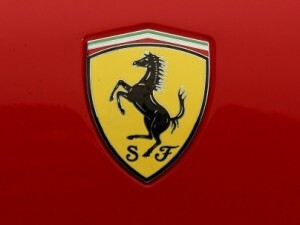 Ferrari smashes its way into the record books again. US$38.1 million,for this splendid red Ferrari 250 GTO Berlinetta built in 1962, one of only 36 built. The 250 GTO was the last front engine coupe built by Ferrari for racing. A cult car of the swinging 1960’s…… Car auctioned at Bonhams Quail Lodge Auction. 14.08.2014. Images courtesy Bonhams. Reports Christopher Loyd, The New York Times. Stud Farm. 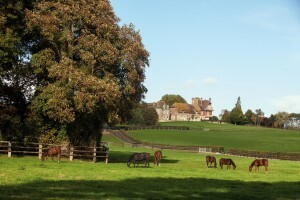 Haras La Reboursiere et La Montaigu. 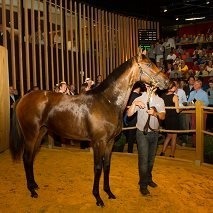 Present future race horses at the Arqana Deauville August Auction. 16-18 August 2014. 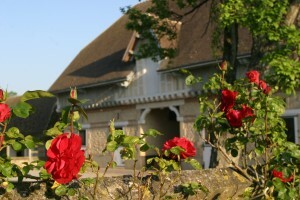 Haras La Reboursiere et la Montaigu. Un parfum d’excellence for this reputed stud farm presenting young future race horses at the Arqana Yearling auctions, 16-18th August 2014. 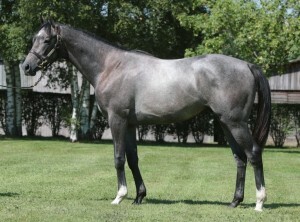 Yearlings featured lot 38 rey colt by High Chaparral out of Viva Maria. Lot 81 chestnut Filly by Galileo out of Dance Secretary. 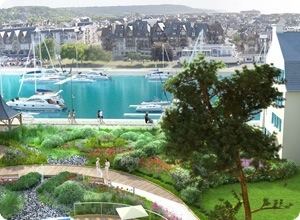 Legacy Investments in France. Fiscal advantages. Information & brochures available direct from the World class Constructor. Legacy Investments in France. Fiscal advantages. Infos direct from Chargée d’Affaires of the Constructor. 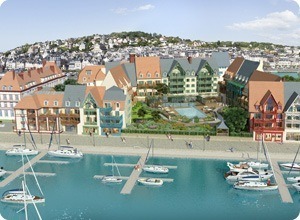 Holiday property portfolios with guaranteed rents. One of Europe’s leading construction companies offers investment opportunities. Idyllic surroundings with splendid sea views. Request bona fide details & brochures available thru Chargée d’Affaires Jessica. 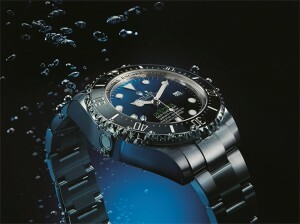 Rolex.Stunning Deep Sea Rolex with D-Blue dial that changes colour from blue to black. 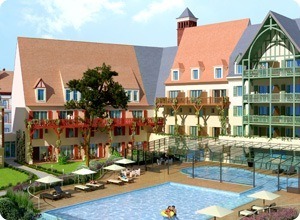 Deauville. Arqana Auctions 16/18th August 2014. Ecuries Monceau. Photo Ecuries Monceau. 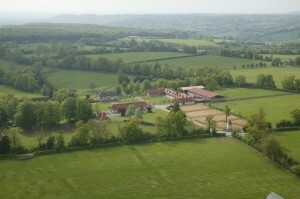 A successful Stud Farm set in the rolling hills of the green Normandy, 2 hours from Paris and close to the English Channel. Perfect for breeding race horses. 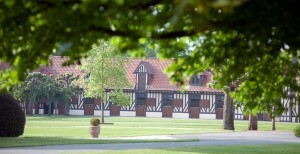 Arqana shareholder, His Highness the Prince Aga Khan, owner of a famous stud farm in Chantilly & in the great tradition of supporting horse breeding in France, has an investment in Arqana the Auction company, which will be auctioning future race horses at the popular Yearling Sales 16/18th August in Deauville. 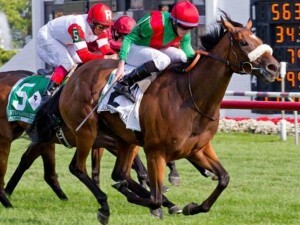 Today we are featuring Ecuries Monceau who consistently produce young horses that go on to be highly successful race horses. 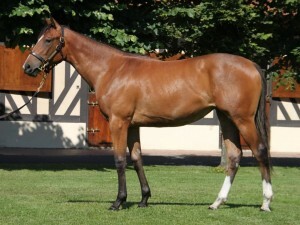 We have selected 3 from this years crop presented by the Ecuries Monceau :- INVINCIBLE SPIRIT/PRUDENZA. Brother to the famous race horse Chiquita. KENDARGENT/ENJOLEUSE. sister of Charm Spirit. and GALILEO/ ROYAL HIGHNESS. Sister of Freeport Lux. Arqana expect buyers & investors from around the World for their August 2014 Yearling sales for future race horses. Photos courtesy Ecuries Monceau.